In the Mid-Atlantic States, winter is upon us. Some states have seen a large amount of snow already while others have only received a sparing amount. We thought now would be the best time to talk about snow guards and why they are an important investment for Conestoga® pole buildings in the Mid-Atlantic region. 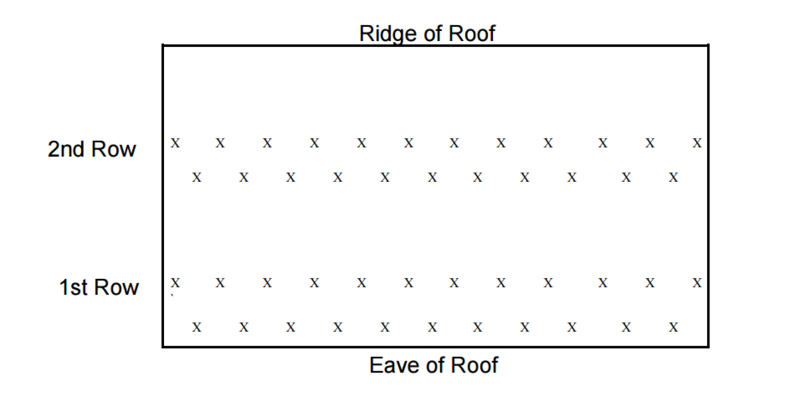 Some buildings such as those with a low roof pitch do not need snow guards. If you aren’t sure if you should consider snow guards, a sales consultant can advise you based on your specific project! Don’t be fooled, there is a science behind installing snow guards. The layout of the guards is the most critical part of a snow retention system. The first row of snow guards includes two rows of guards, placed toward the bottom of the eaves of a building. This is the standard option for most pole buildings. They’re mounted on the flat part of the metal roofing panel and installed with 9” spaces between the guards. During installation, the snow guards are placed in a zigzag pattern, which helps break up snow for easier melting and allows snow to fall off in small amounts. A second row of snow guards can be considered for structures with higher pitches. Those are installed higher on the roof to help reduce pressure on the first row of snow guards from a heavy snow load. There are several snow guard calculators on the Internet to help you determine if you need a second row of snow guards. Our snow guards are made of stainless steel and measure 4” x 3” (WxH). They are available in over 30 powder-coated colors, have excellent fade resistance and do not require caulk for installation. You can match your snow guards to the color of your metal roof or try something unique by choosing a different color to catch attention. Here at Conestoga Buildings, we’re accustomed to building in winter, but also FOR winter. With our customers residing in a part of the country accustomed to seeing snow, we are experienced with installing snow guards and making recommendations based on your specific project. Call us or request a quote to get your project started!